After Aldershot suffered a heavy defeat on the weekend against Wrexham, Manager Barry Smith wanted his team to improve on every aspect of their game. However, the Shots were held to a 1-1 draw on Tuesday. A stunning first half goal from former Aldershot striker Stefan Payne gave Dover the lead. 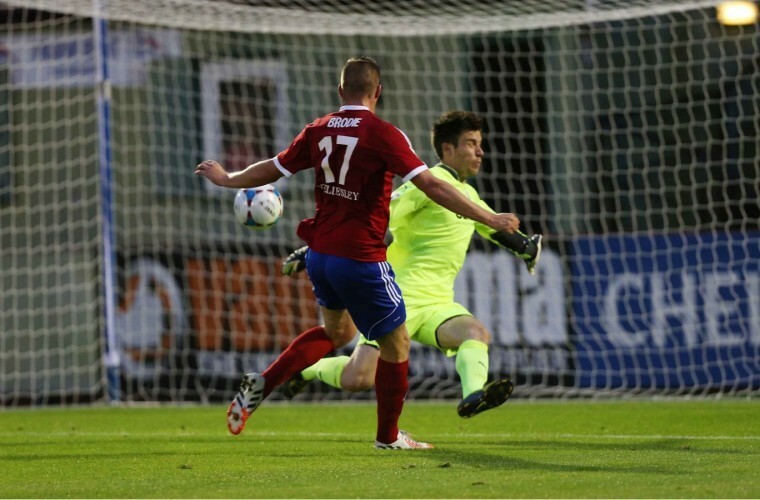 30 minutes later, Aldershot drew level with striker Richard Brodie scoring on his home debut. Aldershot Manager Barry Smith, made 3 changes from the team that were blown aside by Wrexham. With captain Sean McGinty still injured, Sam Hatton went into the side and captained Aldershot on the night. Debutants Richard Brodie and Jake Saville were the other two changes, making way was Rhys Browne, Jake Gallagher and new signing Nick Anderton, who was out injured. Dover looked the more dangerous from the referees whistle, coming close on two separate set piece incidents and although nothing was on target, the anticipation was if Dover had an on target opportunity it could be a goal and that is exactly what happened when Stefan Payne scored a sublime goal. Picking the ball up on the edge of the Aldershot box, he dragged the ball to the side giving himself that extra yard to curl the ball over Phil Smith. Fully rooted to the spot there was nothing Smith could do but admire the strike and dig the ball out of his own net. The home side were certainly struggling, they couldn’t find a way to get through the Dover defence, causing the home fans to get frustrated. However at the other end Ricky Miller nearly came close forcing Smith to make a great save. Thirty minutes had passed before Aldershot started to play more up the field, this helped them created a good chance from a corner. The in-swinging corner came out to Sam Hatton, he then drilled home a shot just past the post. Moments later, at the other end Stefan Payne hit the post after some quick counter attacking play and although the shot was ruled offside, Aldershot were caught sleeping. On the 37-minute, Aldershot were in fine voice after Richard Brodie levelled the scoring. The move started with a fine volleyed pass from the energetic Jim Stevenson to Richard Brodie, and he neatly slotted the ball over the on running goalkeeper Mitch Walker. The home crowd responded in fine voice, but this didn’t stop Dover. Short moments after Brodie’s goal, Dover defender Sean Raggett headed just over the bar from a corner giving Aldershot fans a real scare. With the first half in its final moments, the game became a real end to end affair. Both sides creating real chances but it was Aldershot who came close. An intense scrabble in the 6 yard box meant Dover goalkeeper Walker had to make 3 consecutive fine saves from Matthew Barnes-Homer, Hatton and Brodie. In the act Walker done well to keep the scored level as the teams went into the dressing rooms for half time. In the second half, it was much like the first. It was a slow start from Aldershot but a good chance came when Hatton played in a good direct ball to Beckles, he then nodded the ball to Brodie who headed straight into the goalkeepers chest. Stefan Payne was then looking for his second of the night but was denied by Smith who comfortably saved the drilled shot. In the final stages of the match, the busy Stefan Payne then had a tame shot, which was heavily blocked, nearly drifting into the Aldershot net. Luckily the ball went behind over the post and the resulting corner came to nothing after Aldershot done well to clear the danger. The biggest change of the game happened when Aldershot manager Smith brought on the dynamic duo of Rhys Browne and Tom Richards, with 20 minutes to go. Substitute Rhys Browne made an impressive dynamic change to the game, Aldershot as a team going forward became more aware of the counter attacking chances. One chance fell to Richards after Browne played the ball, through the Dover’s defence, but Richards couldn’t compose himself enough and sliced the shot wide to the Aldershot’s fans despair. Ricky Miller then had a go, but his shot was deflected by Luke Oliver which worried Phil Smith as the ball spooned over him for a corner. The resulting corner was a good move from Dover as the ball came into the box, Sean Raggett just didn’t have enough to direct his header on target. The hosts spurred on with late pressure and it gave hope of a potential goal. But Dover held their own and stuck out the pressure. It was a fair result in the end of the game. Both sides will feel as if they had their own chances to put the game to bed, but both sides just lacked the final composure on certain occasions. Rhys Browne’s introduction to the game certainly gave Aldershot the momentum, but the chance of the match fell to substitute Tom Richards who drifted his shot wide from 10 yards out. Aldershot: Smith, Lathrope (Browne 45), Saville, Oliver, Hatton, Stevenson, Barnes-Homer (Richards 73), Alexander, Beckles, Brodie, D. Walker. Unused subs: C. Walker, Thomas, Gallagher.